Security area (firewalls, proxies, load-balancers, IDS/IPS; includes physical appliances, virtual appliances running in NSX environment /private cloud/ and virtual appliances running in public cloud services /Amazon, AWS/). Top level of escalation/support for several Aon operational teams (SOC, TRACC, GEOC etc). BlueCoat (now Symantec) ProxySG, PaloAlto FW+Panorama, Cisco ASA, F5, McAfee; Menlo (web isolation services), Symantec WSS. Working for SOC team in Akamai/Prolexic. Managing&monitoring network infrastructure and network devices in Akamai/Prolexic scrubbing centers, used for mitigating DDoS attacks. Coping with network issues and incidents, solving network problems, supporting SOC team in some mitigation issues. 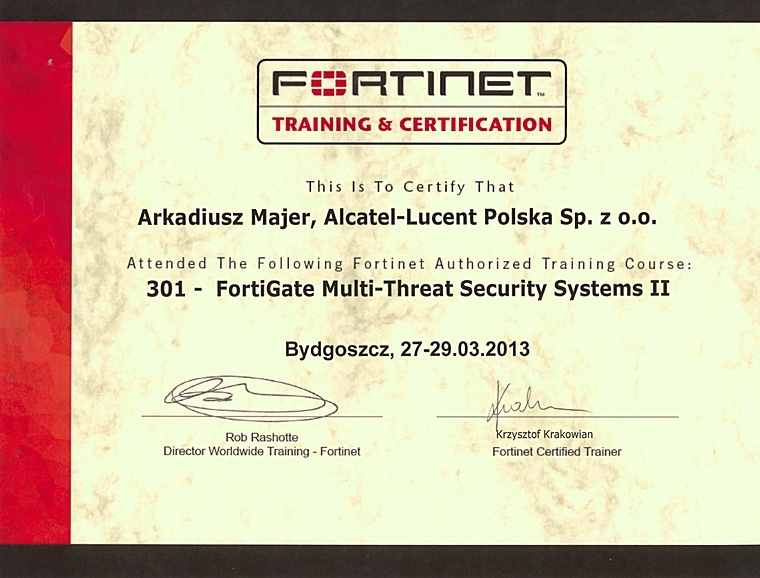 Prolexic is the world's largest, most trusted Distributed Denial of Service (DDoS) mitigation provider. Able to absorb the largest and most complex attacks ever launched, Prolexic restores mission critical Internet facing infrastructures for global enterprises and government agencies within minutes. Six of the world's ten largest banks and the leading companies in e-Commerce, payment processing, travel/hospitality, gaming and other at risk industries rely on Prolexic to protect their businesses. Founded in 2003 as the world's first 'in the cloud' DDoS mitigation platform, Prolexic is headquartered in Hollywood, Florida and has scrubbing centers located in the Americas, Europe and Asia. Implementing changes, resolving network issues, upgrading software, taking part in development of new features and services. BASE project has been taken over by Tech Mahindra, for 6+ weeks I was staying in Hinjewadi/Pune, India, providing trainings and knowledge transfer to Tech Mahindra engineers (security team). Assigned to team responsible for UK projects (managing customers’ networks of UK group). 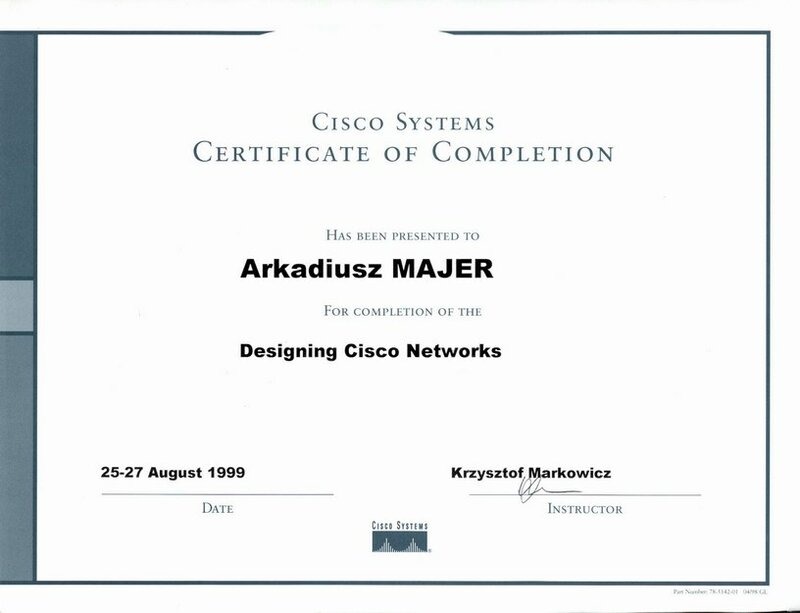 Working with Cisco devices (routers, switches-also with FWSM/ASA/LB modules, load-balancers), Checkpoint firewalls, network analysing devices (NetScout). Since January 2005: Responsible for capacity planning of TP POLPAK core network, especially in terms of deploying ADSL services (Neostrada, InternetDSL, wholesale DSL) and also corporate services (Metro Ethernet, MPLS interconnections). 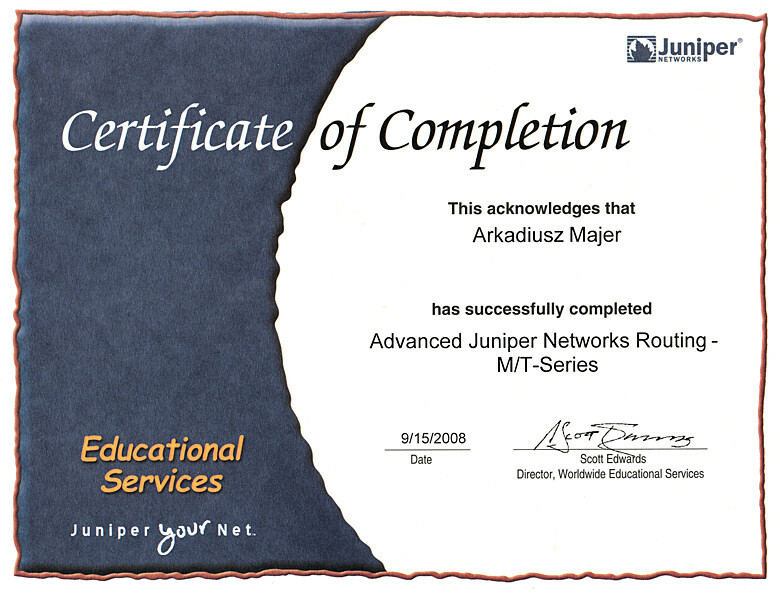 Access to core TP POLPAK network (based on Juniper routers). 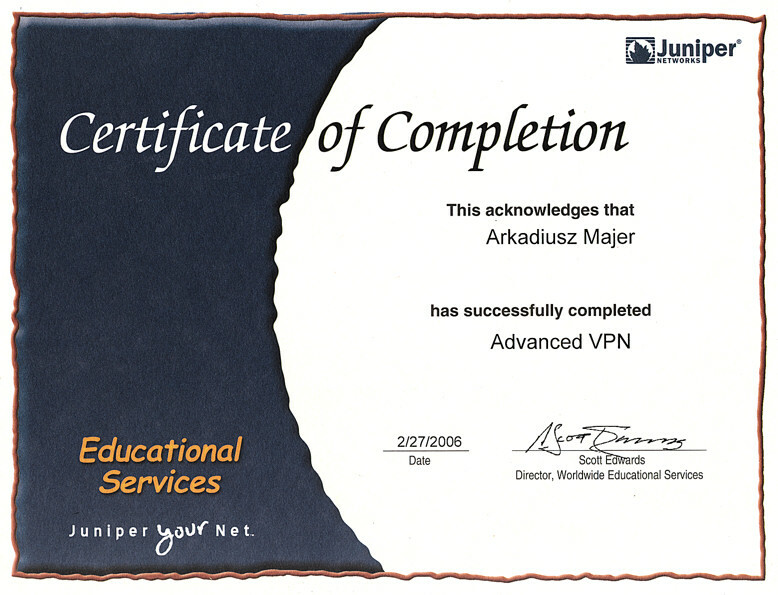 Since August 2007 (primary task): I become a part of EQUANT IPVPN team (EQUANT IPVPN - old name of Orange Business Services /OBS/, before rebranding) responsible for business VPN services (VPNs based on IP/MPLS) with strict cooperation with OBS engineers in other countries (mainly in home of OBS - France). I was responsible for PE/RR/P engineering rules, evolution of VPN services (capacity planning, core/edge development, core services development, edge /customer/ services development like BusinessEverywhere). Developing IPSec services (IPSec terminated on Cisco 7200 boxes) for mobile users for access to their VPNs from Internet cloud. Developing NAT/FW rules on Juniper boxes (Junipers used as PE/FW/Internet Gateways). Creating engineering rules for NNI interconnections (RF 4364, back-to-back VRFs) between Telekomunikacja Polska S.A. (TP S.A.) and its partners (Telefonica from Spain, T-Systems from Germany). Since December 2009 taking part in project for core merging (merging of two separate backbones- IP/MPLS backbone for domestic services, like home xDSL users/Neostrada users, and dedicated IP/MPLS backbone for IPVPN business services). This project is running now in TP S.A. - my part was to prepare engineering base for merging, several scenarios for merging. And, the last stage of this project during my employment- some financial analysis of this project. Everything with very strict cooperation with OBS. This project is very unique on international scale- many telecoms would like to do such thing for cost cutting. Maintaining laboratory with main equipment of TP S.A. core network (Juniper m160, m40e, m10i; Cisco GSR, ESR, 650x, 760x and many others; Nortel Passport 100k, 20k; Nortel Optera Metro - for DWDM ring). Creating and providing environment for software/hardware/configuration/availability/performance tests, for internal TP SA needs. 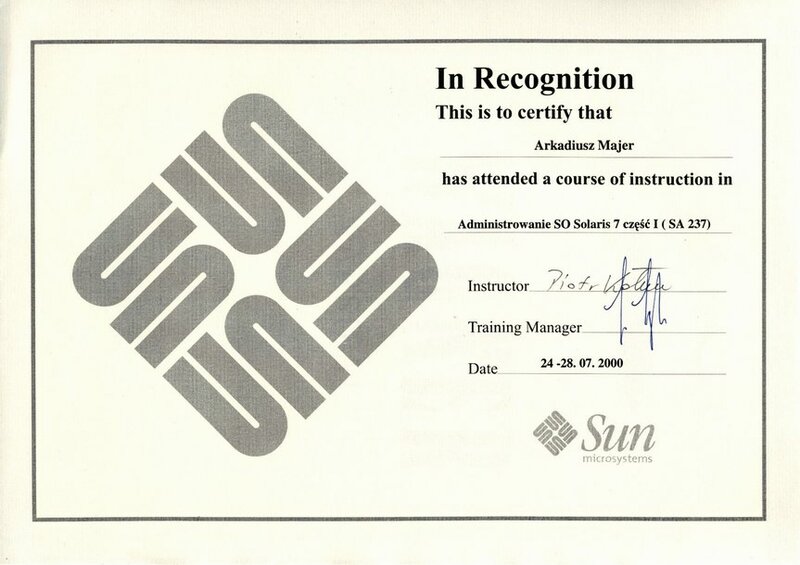 Also providing hardware/software environment for certification purposes. Deploying CACTI for lab monitoring (on FreeBSD + MySQL + Apache + PHP). Deploying remote access with IPSec to lab. - Configuring network devices. 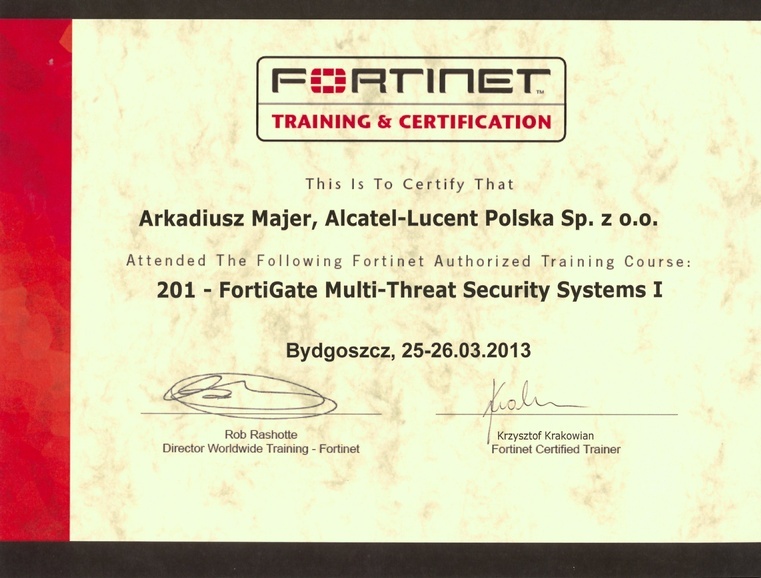 Responsibility for network security. Monitoring local network, administrating firewalls, maintaining antivirus servers structure (Symantec AV Corp. Edition, plus ca 150 workstations-clients). - Administration Windows NT-based network. 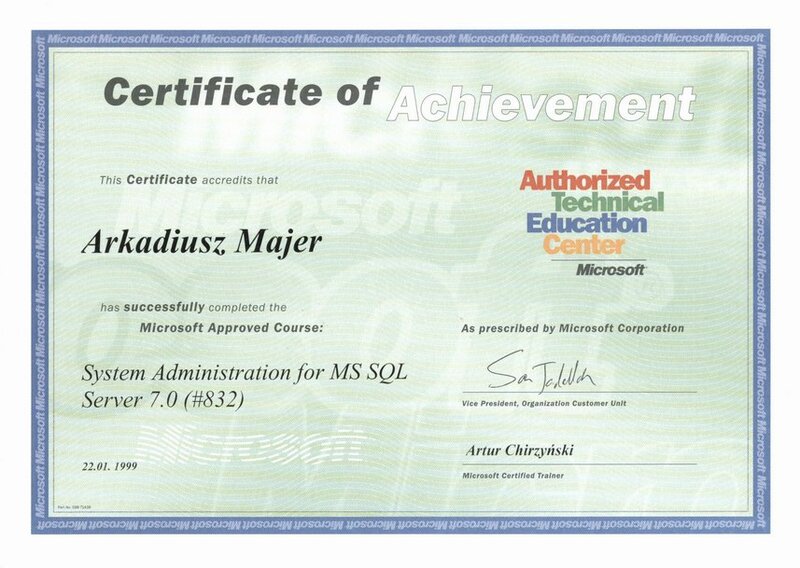 Administrating MS SQL 2000, Oracle 8.0.5, MS Exchange 5.5, print and file servers, RAS-servers. Responsibility for tape back-ups (using Veritas BackupExec 9.0 with tape library). 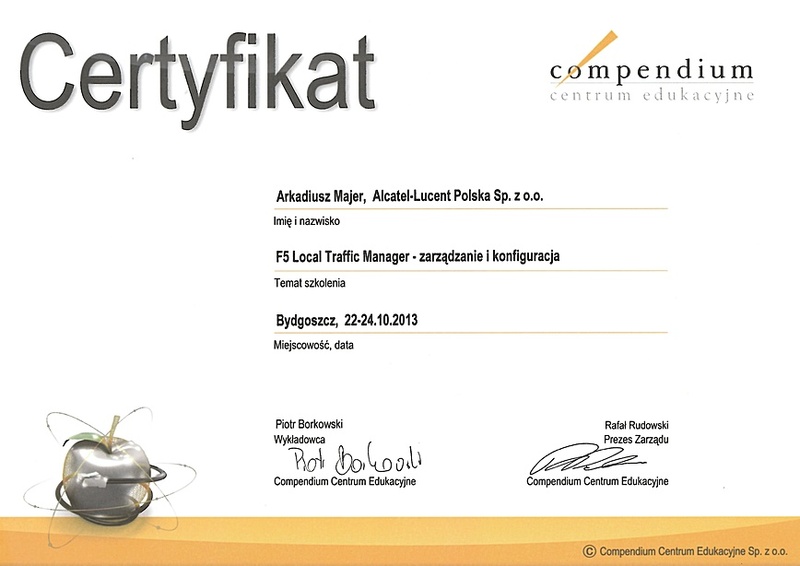 - Maintaining secure communications to Internet and more than a hundred shops in Poland, via Frame-Relay and ISDN links. Installation/configuration/maintenance of linux/FreeBSD-based servers (firewalls, proxy, www, dns). Implementing IDS system (Snort/MySQL/ACID/apache), on FreeBSD platform. - Helpdesk services. 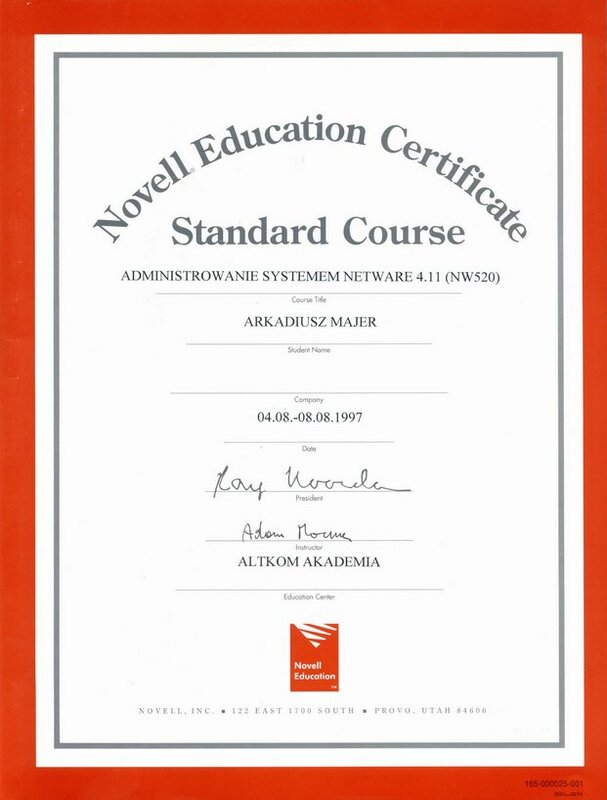 - Designing and implementing networks for companies like Euronet, Pol-Pager, Prochem S.A., “Administracja Domów Komunalnych”, Orix etc. - Implementing FreeBSD-based servers with intranet services, like www, proxy, news, IRC, FTP, for internal users of Raiffeisen Bank Polska S.A.
- Reorganizing and securing Raiffeisen Bank network. 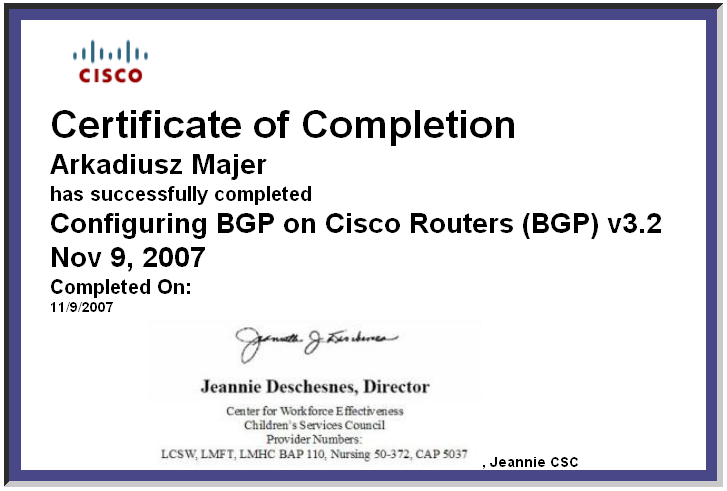 - Developing project for VoIP and BGP for internal Telecomm Systems Sp. z o.o. purposes. - Configuring and maintaining Cisco network devices. - Monitoring and administration of TPI network (based on Fast/GigaEthernet, ATM and Frame-Relay). 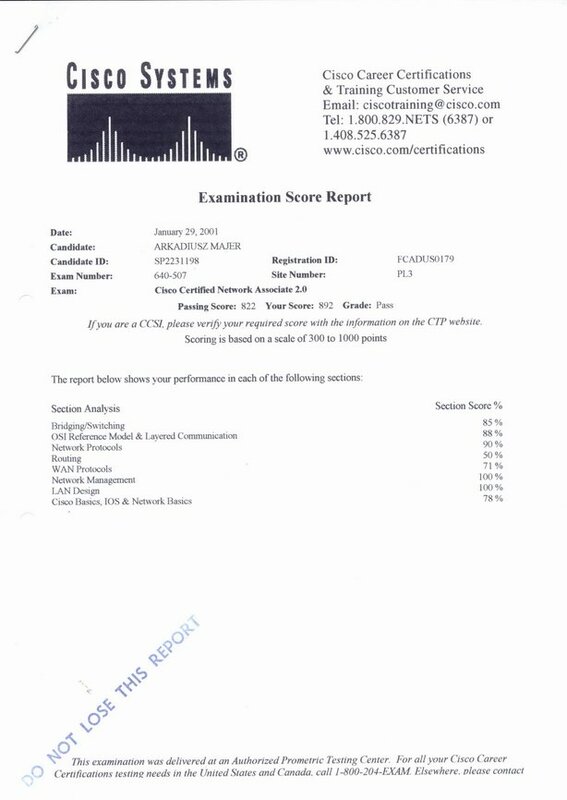 - Building tremendous network infrastructure in TP Internet, based on Cisco hardware (routers 75xx, switches 65xx, PIX Firewalls 520, LocalDirectors 430, NetRangers). All TPI services depends on this network: www.portal.pl, mail.idea.net.pl, www.tpsa.pl, www.signet.pl, Quake server, one of the biggest news servers in Poland - news.tpi.pl, "Konta dla Szkół", hosting of servers and services for TPI customers. - Developing network for real-time TV transmissions during first BigBrother edition, with implementation of RealAudio streaming. 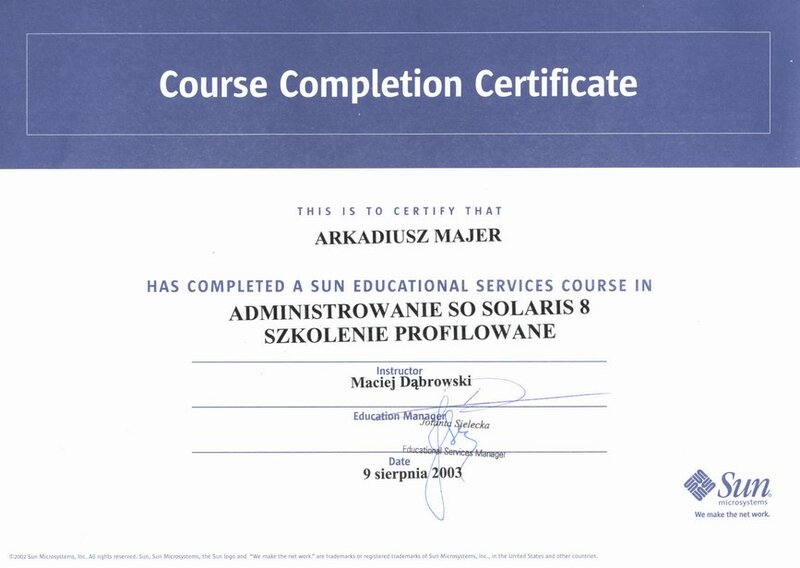 - Implementation of CiscoWorks 2000 and Resource Manager Essentials for network monitoring, on Sun Solaris 7 with HP OpenView. Installation of AAA system (Cisco ACS and Livingstone RADIUS), to control access to network devices and to enable remote access for TPI administrators. - Rebuilding WAN network to connect TPI partners and customers. - Supervising and securing network (introducing Cisco NetSonar for scanning vulnerabilities and Cisco NetRanger as an IDS). Taking parts in security audits. Implementation of security policies. - Co-operation with Signet during implementation of PKI system. - Rebuilding and enhancing hardware and network structure for efficiency, quality and functionality. - Administrating NT servers and office LAN. - Implementing security policy based on ENSI security audit. - Mastered MS Exchange which was used as a data workflow system in office. - Tested various juke-box systems for data archivization. - Maintenance on Microsoft, Novell and SCO Unix systems. - Administration of Alcatel 4220/Alcatel 4400 PABXs. - LAN/WAN administration, based on Cisco devices (routers, switches, firewalls). 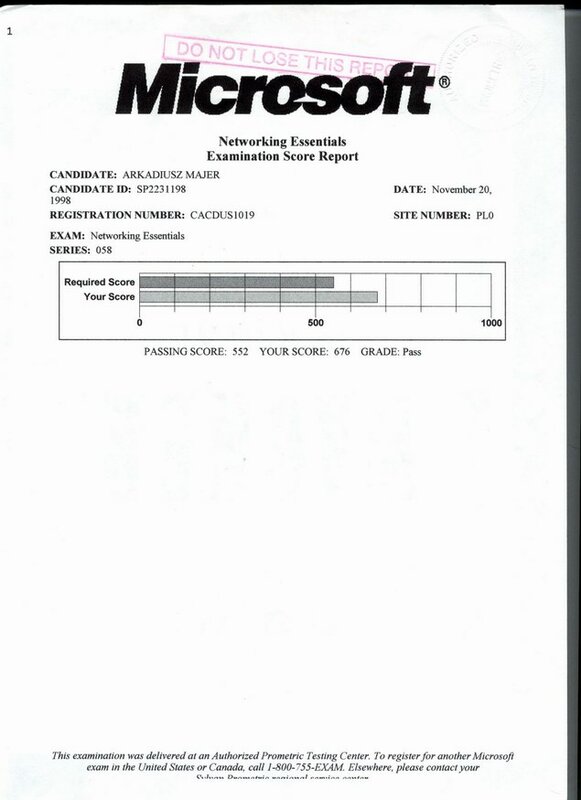 - Perfectly mastered LAN/WAN environment. - Migration from Alcatel 4220 to Alcatel 4400 PABX. Full implementation of A4400, with installation of Voice Mail system, Interactive Voice Response system, and voice call management. 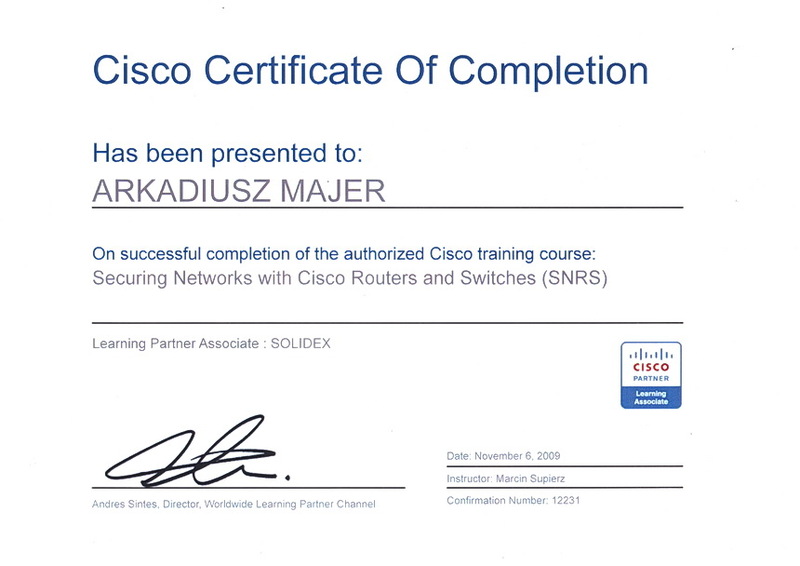 - Establishing connection between Techmex headquarters (Warszawa and Bielsko-Biała) based on Frame-Relay protocol and Cisco routers. - Launched Citrix MetaFrame on Windows NT 4.0 TerminalServer Edition to ensure remote access and transactional operations from stations in Warszawa HQ, to SQL database installed on Digital Alpha 7300. - Taking parts in implementation of MRP2 system-GPS DyNAMICS 5.0 based on MS SQL v6.5. 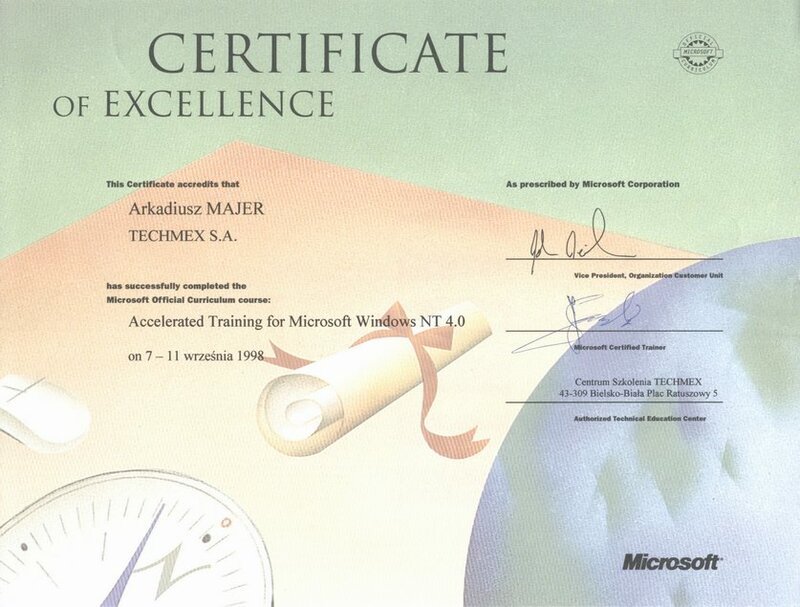 - Introduced Techmex Web server based on MS IIS v4.0 (a migration from web server based on SCO Unix and Apache). - Completely rebuild existing cable infrastructure to ensure structuralism and Cat-5 standards. - Rebuild LAN topology and structure to guarantee the highest possible security level (via installing and implementing Cisco PIX Firewall, creating DMZ for public-accessible servers, upgrading and enhancing active network devices). - Interesting hardware configurations for different promotions, customer trainings and shows (for instance, configuring ISDN connection between Cisco routers and Alcatel PABX working as a ISDN switch to test various ISDN protocols). - Installation of operation systems and applications. - In-depth knowledge of PC hardware. 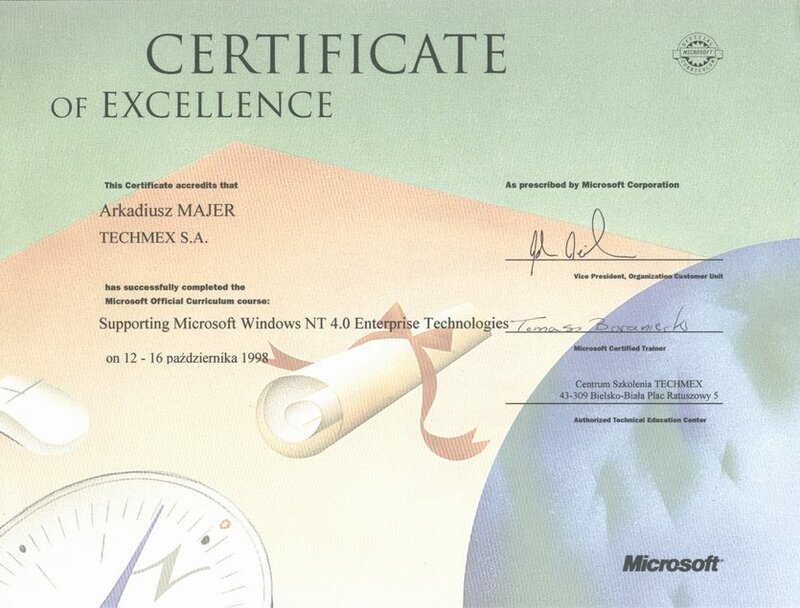 - Familiarity with MS Windows 95/98/NT4.0. 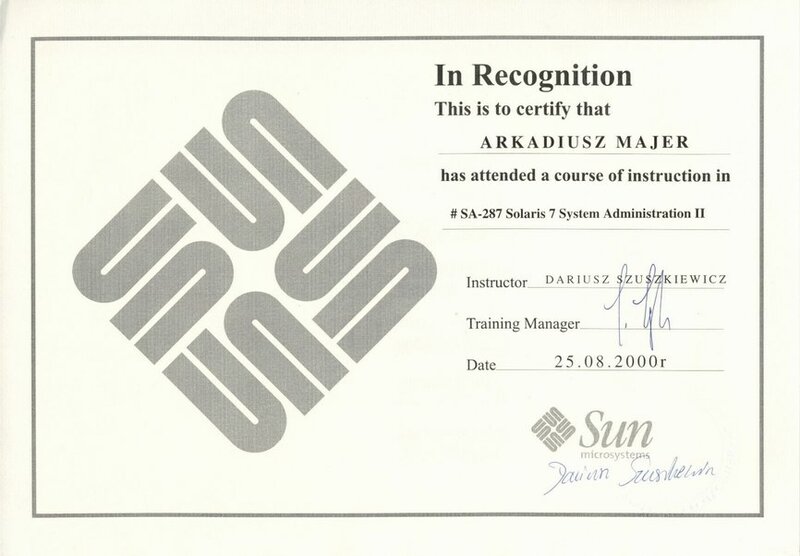 1997-1999Interrupted individual studies at Silesian Technical University, Gliwice. Securing IP networks. Creating and implementing firewall systems. Integration of heterogeneous network systems with telco communication systems (like PABXs). Designing, implementing and troubleshooting TCP/IP networks. TCP/IP data flow analysing, monitoring, bandwidth management, access-control.